Arthropod assaults on humans can have many manifestations clinically, histologically, and immunologically. Hemiptera is an order of insect species of "true bugs" that has piercing-sucking mouthparts and includes the family Cimicidae (bedbugs), which are blood-sucking ectoparasites of mammals or birds. All Cimex species organisms are reddish brown insects. Cimex lectularius is 5-7 mm in size, with the females slightly larger than the males. Cimex hemipterus organisms are approximately 25% longer than C lectularius organisms. Females deposit fertilized eggs in cracks or crevices, with newborns emerging in 4-5 days. Note the images below. The bedbug is a flat, oval, reddish brown insect that turns violaceous after feeding. Courtesy of Colonel Dirk M. Elston, MD (from Elston, 2000). Bedbugs are parasitic arthropods from the family Cimicidae. They are typically less than 1 cm in length and reddish brown in color. Bedbugs can be found in furniture, floorboards, peeling paint, or other small spaces, most commonly in areas of clutter. These insects come out at night in search of prey upon which to feed, with peak feeding times just before dawn. Bedbugs are typically attracted to body heat, carbon dioxide, vibration, sweat, and odor. The image of a Cimex lectularius is shown courtesy of the US Centers for Disease Control and Prevention (CDC). See When Bugs Feast: What's Causing that Itch?, a Critical Images slideshow, to help identify various skin reactions, recognize potential comorbidities, and select treatment options. Bedbug infestations seem to be increasing around the world at an alarming rate, possibly due to insecticide resistance. Resistance to pyrethroid insecticides is already widespread in the United States. The bedbug occurs in aggregations when conditions are favorable, but the arthropods disperse when conditions are unfavorable. Active female dispersal can potentially lead to treatment failures and should be taken into account when using control methods. The tropical bedbug (Cimex hemipterus) has reappeared in Florida after nearly 60 years. C hemipterus is behaviorally and biologically similar to C lectularius. 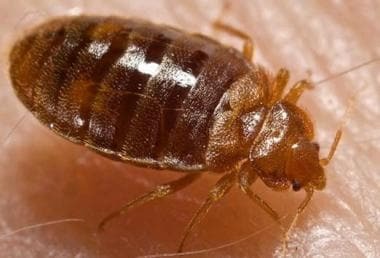 How this particular type of bedbug was reintroduced is unknown, and more research is needed to determine its distribution and how established it is. The mechanism of skin injury by arthropods depends on the structure of the mouthparts. These insects are categorized as vessel feeders if they insert the tip into a capillary or as pool feeders if they feed on the extravasated blood from damaged tissue. They often inject different pharmacologically active substances (eg, hyaluronidase, proteases, kinins), which may cause different skin reactions (eg, erythema, wheal, vesicle, hemorrhagic nodule). See the following images. Bedbugs feeding on a human host. Courtesy of Colonel Dirk M. Elston, MD (from Elston, 2000). After bedbugs find a food source, they bite down with their mouths and inject anticoagulant and anesthetic compounds into the skin. Depending on the species, these parasites feed on the host blood via 1 of 2 mechanisms. Vessel feeders directly insert their mouthparts into superficial capillaries, whereas pool feeders damage the superficial tissue and feed on the accumulated blood. As bedbugs feed, their color may change as they swell with the host blood, as shown in this picture of a larval bedbug feeding on a volunteer host. Image courtesy of the US Centers for Disease Control and Prevention (CDC). The type of reaction provoked depends on previous exposure; repeated bites may lead to an allergic reaction, which may lead to pronounced cutaneous manifestations. Some patients show a severe systemic hypersensitivity to arthropod allergens. The site of the bite can also become secondarily infected with bacteria infection and lead to ecthyma, cellulitis, and/or lymphangitis. Bedbug bites themselves are typically painless. However, the subsequent allergic reaction that may develop can cause intense pruritus. While feeding, bedbugs may inject one of several pharmacologically active substances, including hyaluronidase, proteases, and kinins. These compounds may induce different skin reactions, such as erythema, wheals, vesicles, or hemorrhagic nodules. Repeated bites may sensitize individuals, leading to more pronounced cutaneous manifestations or systemic hypersensitivity reactions. The local trauma from bedbug bites can lead to secondary bacterial infection, causing ecthyma, cellulitis, or lymphangitis. There is some evidence that bedbugs may also be a vector for hepatitis B and Chagas disease. Histologic findings from bite-site biopsy specimens typically show eosinophilic infiltrates, which are indicative of the allergic nature of the reaction. The image shown is papular urticaria, which may develop from bedbug bites. Thus, although these insects usually cause mild cutaneous reactions, more severe responses, including anaphylaxis, may occur. Bullae may be noted. Skin responses at bite sites may evolve from immediate, pruritic, edematous macules into bullae within 24 hours. Histopathologically, an urticarial-like reaction can develop into a leukocytoclastic vasculitis, sometimes with a destructive, necrotizing, eosinophil-rich vasculitis with prominent infiltration of CD68+ histiocytes and collagen necrobiosis. Insect bites, including those from the bedbug, have been proposed as a factor contributing to the formation of a cutaneous reaction termed papular urticaria. Patients with papular urticaria have been shown to demonstrate immunoglobulin (Ig) G antibodies to bedbug (C lectularius) antigens. Thus, IgG against C lectularius, Cimex pipiens, and Pulex irritans in patients with papular urticaria may contribute the pathogenesis of this condition. Susceptibility to arthropod bites depends on many external factors, such as occupation, conditions of employment, cohabitation with a variety of domestic animals, housing, climate, and clothing. An arthropod is usually attracted to its host by body heat, carbon dioxide in exhaled air, vibration, human sweat, and/or odor. 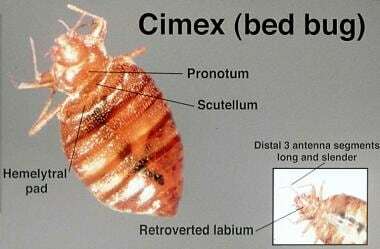 The Cimex (bedbug) genus attacks both mammals and birds. C hemipterus (the tropical bedbug) bites mostly humans and is found in warm climates, whereas C lectularius (the common bedbug) also attacks bats and domestic animals, such as chickens. Bedbugs are 5-7 mm in length with reduced wings and modified mouthparts for piercing and sucking. These insects live between wooden floorboards, in furniture, in bed frames, in mattresses, or behind peeling paint. Bedbugs sneak out to grasp human skin with their forelegs, pierce the skin, and inject anticoagulant- and anesthetic-containing saliva. Bedbugs normally feed at night, usually approximately 1 hour before dawn. However, if the conditions are favorable, they also feed during the day. Feeding takes 3-12 minutes. In proper conditions, adult bedbugs can survive without a meal for 1 year or longer. Each female lays approximately 300 eggs in her lifetime. The eggs hatch in 10 days. The nymph stage lasts 6 weeks, undergoing 5 molts. Bedbugs can be seen anywhere, but they tend to occur in environments in disarray. Old furniture makes an excellent home for bedbugs. These insects also like to hide in the seams and folds of mattresses and in bed frames and springs. The prognosis for bedbug bites is excellent, although these bites can create considerable anxiety and localized and occasionally systemic reactions. 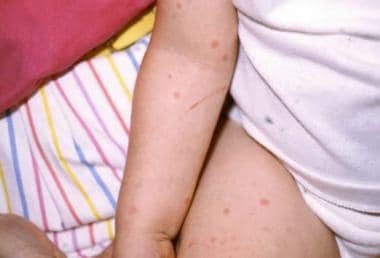 Sometimes, if the bite reactions are intensely pruritic, scratching with excoriations may be complicated by impetigo. Anaphylactoid reactions are well described. One such case occurred in a 41-year-old businessman in a first-class urban hotel in the United States. Educate the patient and family about bedbugs and their habits. Patients should avoid scratching the bite sites to reduce local irritation and prevent secondary infection. See also Prevention of Bedbug Bites. For patient education information, see Allergies Center as well as Insect Bites and Severe Allergic Reaction (Anaphylactic Shock). Romero A, Potter MF, Potter DA, Haynes KF. Insecticide resistance in the bed bug: a factor in the pest's sudden resurgence?. J Med Entomol. 2007 Mar. 44(2):175-8. [Medline]. Pfiester M, Koehler PG, Pereira RM. Effect of population structure and size on aggregation behavior of Cimex lectularius (Hemiptera: Cimicidae). J Med Entomol. 2009 Sep. 46(5):1015-20. [Medline]. Thomas S, Wrobel MJ, Brown J. Bedbugs: A primer for the health-system pharmacist. Am J Health Syst Pharm. 2013 Jan 1. 70(2):126-30. [Medline]. Patel D, Elston DM. What's eating you? Bedbugs revisited (Cimex lectularius). Cutis. 2012 Oct. 90(4):173-5. [Medline]. Booth W, Balvín O, Vargo EL, Vilímová J, Schal C. Host association drives genetic divergence in the bed bug, Cimex lectularius. Mol Ecol. 2015 Mar. 24(5):980-92. [Medline]. Wang Y, Carballo RG, Moussian B. Double cuticle barrier in two global pests, the whitefly Trialeurodes vaporariorum and the bedbug Cimex lectularius. J Exp Biol. 2017 Feb 6. [Medline]. Reinhardt K, Breunig HG, König K. Autofluorescence lifetime variation in the cuticle of the bedbug Cimex lectularius. Arthropod Struct Dev. 2017 Jan. 46 (1):56-62. [Medline]. Campbell BE, Koehler PG, Buss LJ, Baldwin RW. Recent Documentation of the Tropical Bed Bug (Hemiptera: Cimicidae) in Florida Since the Common Bed Bug Resurgence. BioOne.org Florida Entomologist. Available at http://www.bioone.org/doi/full/10.1653/024.099.0333. September 2016; Accessed: November 11, 2016.
deShazo RD, Feldlaufer MF, Mihm MC Jr, Goddard J. Bullous reactions to bedbug bites reflect cutaneous vasculitis. Am J Med. 2012 Jul. 125(7):688-94. [Medline]. Abdel-Naser MB, Lotfy RA, Al-Sherbiny MM, Sayed Ali NM. Patients with papular urticaria have IgG antibodies to bedbug (Cimex lectularius) antigens. Parasitol Res. 2006 May. 98(6):550-6. [Medline]. Mouchtouri VA, Anagnostopoulou R, Samanidou-Voyadjoglou A, Theodoridou K, Hatzoglou C, Kremastinou J, et al. Surveillance study of vector species on board passenger ships, risk factors related to infestations. BMC Public Health. 2008 Mar 27. 8:100. [Medline]. Gbakima AA, Terry BC, Kanja F, Kortequee S, Dukuley I, Sahr F. High prevalence of bedbugs Cimex hemipterus and Cimex lectularis in camps for internally displaced persons in Freetown, Sierra Leone: a pilot humanitarian investigation. West Afr J Med. 2002 Oct-Dec. 21(4):268-71. [Medline]. Lee IY, Ree HI, An SJ, Linton JA, Yong TS. Reemergence of the bedbug Cimex lectularius in Seoul, Korea. Korean J Parasitol. 2008 Dec. 46(4):269-71. [Medline]. Ogston CW, Wittenstein FS, London WT, Millman I. Persistence of hepatitis B surface antigen in the bedbug Cimex hemipterus (Fabr.). J Infect Dis. 1979 Sep. 140(3):411-4. [Medline]. Pipkin AC Sr. Transmission of Trypanosoma cruzi by arthropod vectors: anterior versus posterior route infection. Int Rev Trop Med. 1969. 3:1-47. [Medline]. Salazar R, Castillo-Neyra R, Tustin AW, Borrini-Mayorí K, Náquira C, Levy MZ. Bed bugs (Cimex lectularius) as vectors of Trypanosoma cruzi. Am J Trop Med Hyg. 2015 Feb. 92(2):331-5. [Medline]. [Full Text]. Iqbal MM. Can we get AIDS from mosquito bites?. J La State Med Soc. 1999 Aug. 151(8):429-33. [Medline]. Webb PA, Happ CM, Maupin GO, Johnson BJ, Ou CY, Monath TP. Potential for insect transmission of HIV: experimental exposure of Cimex hemipterus and Toxorhynchites amboinensis to human immunodeficiency virus. J Infect Dis. 1989 Dec. 160(6):970-7. [Medline]. KINNEAR J. Epidemic of bullous erythema on legs due to bed-bugs. Lancet. 1948 Jul 10. 2(6515):55. [Medline]. Reinhardt K, Kempke D, Naylor RA, Siva-Jothy MT. Sensitivity to bites by the bedbug, Cimex lectularius. Med Vet Entomol. 2009 Mar 9. [Medline]. Crissey JT. Bedbugs: An old problem with a new dimension. Int J Dermatol. 1981 Jul-Aug. 20(6):411-4. [Medline]. Chittoor J, Wilkison BD, McNally BW. What's eating you? bedbugs. Cutis. 2019 Jan. 103 (1):31-33. [Medline]. Liebold K, Schliemann-Willers S, Wollina U. Disseminated bullous eruption with systemic reaction caused by Cimex lectularius. J Eur Acad Dermatol Venereol. 2003 Jul. 17(4):461-3. [Medline]. Masetti M, Bruschi F. Bedbug infestations recorded in Central Italy. Parasitol Int. 2007 Mar. 56(1):81-3. [Medline]. Melnick L, Samimi S, Elder D, Xu X, Vittorio CC, Rosenbach M, et al. Targetoid lesions in the emergency department. Bed bug bites (Cimex lectularius) with targetoid lesions on initial presentation. JAMA Dermatol. 2013 Jun. 149(6):751-6. [Medline]. Scarupa MD, Economides A. Bedbug bites masquerading as urticaria. J Allergy Clin Immunol. 2006 Jun. 117(6):1508-9. [Medline]. Fletcher MG, Axtell RC. Susceptibility of the bedbug, Cimex lectularius, to selected insecticides and various treated surfaces. Med Vet Entomol. 1993 Jan. 7(1):69-72. [Medline]. Weeks EN, Logan JG, Gezan SA, et al. A bioassay for studying behavioural responses of the common bed bug, Cimex lectularius (Hemiptera: Cimicidae) to bed bug-derived volatiles. Bull Entomol Res. 2010 Jan 27. 1-8. [Medline]. Singh N, Wang C, Cooper R. Posttreatment Feeding Affects Mortality of Bed Bugs (Hemiptera: Cimicidae) Exposed to Insecticides. J Econ Entomol. 2016 Feb. 109 (1):273-83. [Medline]. Lindsay SW, Snow RW, Armstrong JR, Greenwood BM. Permethrin-impregnated bednets reduce nuisance arthropods in Gambian houses. Med Vet Entomol. 1989 Oct. 3(4):377-83. [Medline]. Pereira RM, Koehler PG, Pfiester M, Walker W. Lethal effects of heat and use of localized heat treatment for control of bed bug infestations. J Econ Entomol. 2009 Jun. 102(3):1182-8. [Medline]. Wang C, Gibb T, Bennett GW, McKnight S. Bed bug (Heteroptera: Cimicidae) attraction to pitfall traps baited with carbon dioxide, heat, and chemical lure. J Econ Entomol. 2009 Aug. 102(4):1580-5. [Medline]. Barbarin AM, Bellicanta GS, Osborne JA, Schal C, Jenkins NE. Susceptibility of insecticide-resistant bed bugs (Cimex lectularius) to infection by fungal biopesticide. Pest Manag Sci. 2017 Aug. 73 (8):1568-1573. [Medline]. Berenji F, Moshaverinia A, Jadidoleslami A, Shamsian A, Doggett SL, Moghaddas E. Evaluation of the Common Bed Bug, Cimex lectularius (Insecta: Hemiptera: Cimicidae) Susceptibility to λ-Cyhalothrin, Malathion, and Diazinon in Northeastern Iran. J Med Entomol. 2019 Mar 1. [Medline]. Vail KM, Chandler JG. Bed Bug (Hemiptera: Cimicidae) Detection in Low-Income, High-Rise Apartments Using Four or Fewer Passive Monitors. J Econ Entomol. 2017 Jun 1. 110 (3):1187-1194. [Medline]. Ho D, Lai O, Glick S, Jagdeo J. 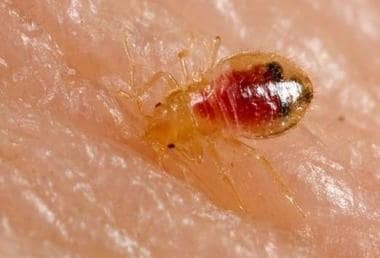 Lack of evidence that bedbugs transmit pathogens to humans. J Am Acad Dermatol. 2016 Jun. 74 (6):1261. [Medline]. Wang C, Lü L, Zhang A, Liu C. Repellency of selected chemicals against the bed bug (Hemiptera: Cimicidae). J Econ Entomol. 2013 Dec. 106(6):2522-9. [Medline]. 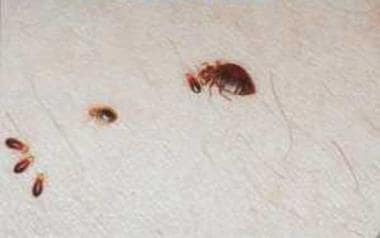 Human infestation with bedbugs, lice, and mites are common causes of dermatologic symptoms. Although these organisms thrive in conditions of overcrowding and decreased sanitation, Americans of all socioeconomic backgrounds may be at risk for infestation. Clinicians must maintain high suspicion in the appropriate set of clinical circumstances to identify and treat infestations, as they can cause substantial dermatologic and psychological discomfort for patients. Images courtesy of the US Centers for Disease Control and Prevention. Treatment for bedbug bites is typically supportive. Local antiseptic lotions or antibiotic creams can be applied for secondary infections, whereas corticosteroid creams and oral antihistamines can be used for allergic reactions. Bedbugs can be eliminated through the use of permethrin insecticides, baited traps, special bedbug-free beds, and bed nets. Homemade methods, such as wrapping duct tape around bed legs as shown, may be effective, but bedbugs have been known to climb other objects and then fall down onto a bed. Image courtesy of Wikimedia Commons. The authors and editors of Medscape Reference gratefully acknowledge the contributions of previous author, Anna Gorkiewicz-Petkow, MD, PhD, to the development and writing of this article.